Note from the LeftEast editors: this article has been published in collaboration with the Balkan web-portal Bilten.org. The original publication can be found here. Liviu Dragnea, the head of the Social Democratic Party (PSD), recently survived a small rebellion. A few of his colleagues asked him to resign his positions as head of the party and head of the Lower House in Parliament. However, Dragnea, whose nickname Daddy evokes the patriarchal atmosphere of a famous Tennessee Williams play, managed to win this battle. Or at least this is what is visible publicly: the internal vote went heavily in favor for Dragnea to stay. If this were simply an internal matter to PSD there would be little interest in following it. But the struggles around Dragnea and inside the party reveal larger societal issues. To begin with, Dragnea ascended to the top of Romanian politics in large part thanks to the anti-corruption campaign that swept away all previous party leaders and opposition after 2005. Without denying his cunningness and abilities, Dragnea was able to rise from a modest local politician in one of the poorest regions of Romania to the status of, arguably, the most important Romanian politician at present chiefly as a result of the way in which the anti-corruption campaign altered the political landscape. It basically made his evolution possible. At the same time, Dragnea is the real embodiment of the transition’s dreams and goals. Born in 1962, he came of age in the grim 1980s, a period of austerity, complete disenchantment with the communist regime and depolitization. An engineer by training – the most idiosyncratic profession in Ceaușescu’s latter years – after 1989 Dragnea developed very small local businesses in his wife’s native village. He worked his way up, accumulating capital and connections in the dog-eat-dog atmosphere of the 1990s. Participation in politics followed naturally since political power was the best way to ensure business success. Always with an eye for the right opportunity, steadfast in his determination and ruthlessly pragmatic, Dragnea first joined the Democratic Party and then switched to PSD before the 2004 elections that PSD won. He was recognized as a tough hand and a reliable local leader, able to gather votes and implement party politics with rigor. Local politics and its constitutive networks of interest and dependency were his natural habitat. Had it not been for the upturn that followed the launch of the anti-corruption campaign after 2004, Dragnea would have faced much steeper hurdles in his ascent to the top of the party. After all, as a local authoritarian, Dragnea managed to combine perfectly politics and business. He amassed a huge fortune for himself and his cronies by controlling key local institutions and businesses. One of his antics might in fact put an end to his career. He pressured the head of a local state institution to hire on paper two people who were in fact working for the party. 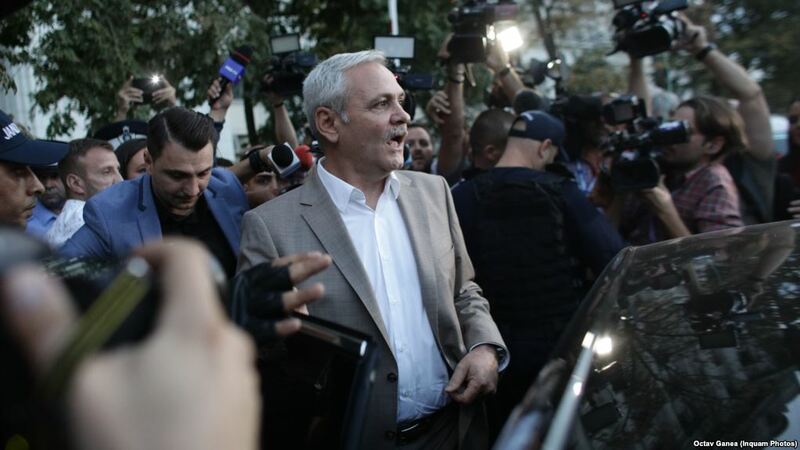 Dragnea has already received a sentence of three and a half years years, but the final verdict has to be confirmed by a higher court. This case hangs like a Damocles sword over Dragnea’s political career ever since he led the party to the 2016 Parliamentary victory. Adversaries and the public in general believe that Dragnea’s actions, especially his meddling with the judiciary, are meant to find a way out of this debacle. Remaining free appears to be the sole long-term purpose of his political actions. By contrast, some of his colleagues accused Dragnea of delaying the party’s assumption of control of the anti-corruption campaign precisely because he seeks a deal with the judiciary concerning his situation. 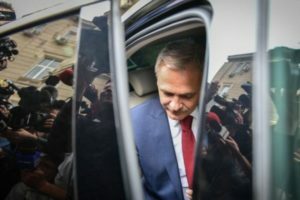 To make things worse, Dragnea is already convicted in a different trial. He was found guilty of rigging votes during the 2012 Referendum to suspend the President, but received no jail time. As a result of this earlier charge, he cannot be the Prime Minister, which in turn led to internal tensions inside the party because of Dragnea’s desire to play puppeteer for the appointed PMs. As a result, two MPs were already ousted, each after less than six months in office. Unsurprisingly, both were among the Social Democrats that asked Dragnea to resign recently. Indeed, his legal record makes Dragnea rather unsuitable to lead the reform of the anti-corruption edifice, even though such a reform is badly needed. The suspicions around his figure are one of the reasons protests against PSD lasted so long. Dragnea offers a perfect target and seems to justify the thought that his actions are strictly driven by his own interests to remain free. Many in PSD, especially the vocal Mayor of Bucharest who allegedly harbors the dream of becoming the next Romanian president, grew increasingly uncomfortable with this situation and Dragnea appears to be more of a liability in this context. With presidential elections coming up next year, Dragnea is far from the leader PSD needs if it wants to select the next president. Dragnea’s own style of ruling (very top-down, Machiavellian, secretive and involving only a selected few) appears to be a reason for internal unrest too. The way he responded to the August 10 anti-corruption protests was also disastrous. First, he sat quietly, even though normally he wants to be very visible and to appear in total control. Then, when he did speak, it was baffling. He blamed the protesters for seeking to produce a coup and told an utterly bizarre story about his botched assassination. It was a weak, paranoid reaction, of a person who had lost control (if not the entire plot) and thus he appeared unsuitable to calm things down to the benefit of the party. On the eve of the decisive PSD meeting on September 21st Dragnea seemed to be in tatters. He was already confronted inside the party less than a month before. This time the opposition appeared more organized and in bigger numbers. In the end he won the motion that maintained him as president of the party for now. But it appears clear that his position inside the party is not as strong as it once was. His staying was not a sign of his force necessarily, but of the fact that concessions were squeezed out from him. This is his strategy: to win support from the powerful local leaders by offering money from the state budget via government spending and key positions in important institutions and ministries. But once you give away these positions you cannot control them any longer, resulting in a loss of power that your enemies can exploit. Paradoxically in order to stay in power, Dragnea necessarily has to lose power and his opponents know that. This is not to underestimate Dragnea’s power base. He managed to win the presidency of the party by promising to promote the interests of the powerful local leaders (he was one of them, after all) and to allow them complete control in their fiefs. Also, he promised to counter the anti-corruption campaign, which was running amok precisely against these local leaders. Since these “local barons”, as they are fondly called in local parlance, are the pillars of power in PSD, it is very hard to rally them around, and even harder to swing them in a different direction. This is why the putsch against Dragnea has failed for now: he remains a credible agent for the barons’ interests. In addition, with a pending trial close to resolution, there is really no need to take out the heavy guns against him. The judiciary might easily bring him down just as it did with other PSD leaders before. In earnest, the putsch itself was half-baked and its most devastating weapon was a letter that asked for the resignation of Dragnea and the reasons for it. Dragnea dismissed it immediately with a jibe. The insurgents failed to rally real support for their attempt but at the same time they gathered enough in order to make it harder for them to be expelled. The meeting ended in a draw, which can only mean more internal saber rattling in the near future. The weakness of the internal opposition to Dragnea mirrors the weakness and ineptness of the opposition to PSD more generally. One of the reasons Dragnea managed to stay in power for so long despite his judicial record and obvious mistakes is the fact that the opposition is in disarray. Such is the degree of this collapse that PSD brought down two of its own governments and stayed unperturbed in power nonetheless. There is no real outside pressure on PSD, except perhaps coming from the street protests, but they lack agenda, leaders and strategy to be in anyway meaningful beyond their sheer existence. The opposition in parliament is either moribund (the liberals) or hysteric (the post-ideological, anti-corruption Save Romania Union). Both have internal problems of their own and do not look likely winners in a direct confrontation with PSD. The idea of early elections, therefore, – mooted by the leader of the liberals – would only help PSD. It also points to the kind of political imagination the opposition is able to produce: one that, if put in practice, would effectively destroy it, not PSD. The newly formed leftist party, Demos, also targeted PSD during the launching speeches. They portrayed PSD as retrograde and undemocratic. This is unmistakably true but also irrelevant. People who vote for PSD do it not because they regard the Party as cutting-edge and progressive, but because it is the only reliable way to further their interests, in one way or another, whatever those interests might be. This is what the opposition does not really get about PSD: for all its many ills it is now the only party embedded in communities and offers them political representation. Surely, this relationship can be contested as patriarchal, abusive and riddled with festering corruption but PSD has a solid social basis and the cadres able to mobilize it. None of the other parties have this, with the obvious exception of the Hungarian minority’s ethnic-based party. To really challenge PSD would entail creating and mobilizing such a social base but at least for now, none of the existing parties is in a position to do so. However, the most risible case of opposition to PSD is that of the “commentariat”, the TV pundits that regularly give their opinions and analyses. They are simply clueless. Every prediction they made regarding the battle inside PSD turned out to be wrong. Every day for two years now they bemoan Dragnea’s tyranny, comparing him with Stalin, Hitler, Ceausescu, Erdogan or Orban. Facile comparisons, simplistic historical references and theatrical indignation are de rigueur if one is to be accepted in the select circle of passionate anti-PSD and anti-Dragnea public figures. But indignation is a way of masking ignorance about PSD and Dragnea in particular (except, perhaps, about the lurid details of his relationship with his much younger girlfriend). Dragnea’s power appears as a mystery and conveniently blamed on a secret pact with the secret services. Following his win in the party (or at least, his survival for now), Dragnea went to a friendly television channel for an interview. Among the many expected platitudes, he said that his party, and he personally, are left-wing. This, of course, is funny given the economic measures the party took and the conservative turn under Dragnea’s leadership. But the question remains: why would Dragnea feel the need to self-describe as leftist? There is no real need to do so, since there is no real market or desire for the left locally. Why then this sudden turn to ideology? Simply put, it is an attempt made by Dragnea to pivot from his case towards the policies of the party, which have led to significant increases of salaries for many state employees, and an increase of the minimum wage and pensions in the last several years. He invites the public to forget his personal ills and concentrate instead on the social record of the party under his leadership. Contestation against him is then reframed as a right-wing attack on party’s social measures. It’s a cheap trick from the arsenal of a politician who survived so many battles that he should have a new nickname: the Revenant. However, it might be Dragnea’s last unwitting contribution to local politics: to rearticulate and re-politicize publicly the right-left antagonism by trying to maintain his power. It would be no small feat for a politician. On the March: Romania and its Road to Mi ..
Friends and Foes. Traditional and Alt-Ri .. 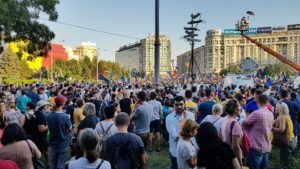 Between Self-Hatred and Geopolitics: Rom ..
On October 6 and 7, Romanians go to polls in a referendum aimed to change the definition of family in the Constitution. The initiators – the Coalition for Family, a network of right-wing civil society associations backed by US neo-protestant money and the local Orthodox Church – want to have it inscribed in the Constitution that marriage is the union between a male and a female. The implications are clear and so is their target: the LGBT community. Dragnea came out live on television and announced that he will vote Yes, despite the fact that officially the party is not involved in the referendum. This was hardly surprising, but it does mark a clear moment: it is the first time when a leader of PSD openly and unequivocally embraces conservative values and positions himself in no ambiguous terms against the values of the European Social Democrats (in fact, the Romanian Prime Minister was quizzed in Brussels on the topic of the referendum and, of course, she lied by saying that PSD would not get involved). Again, this is no small feat. The conservative, xenophobic and sovereign turn of PSD under Dragnea’s leadership was uncontestable. Now it is in the open and self-professed. What critics of PSD tried to affirm polemically, Dragnea now said publicly. He thus dispensed with any veneer of progressivism PSD might still elicit given its name. And with that, as predicted, the transformation of PSD in the mold of FIDESZ or PIS is now complete: an alleged left-wing economic agenda (in fact paternalism for the most faithful clients) combined with a hard-core nationalist, xenophobic and homophobic cultural agenda. In short, post-fascism – to invoke G.M. Tamas’ concept. While Dragnea might not be in the same league with Orban and the rest, and his time might be up soon, his leadership has dramatically transformed PSD and with it, the society at large. His power will be long felt after he is gone. Florin Poenaru is an anthropologist and co-editor of CriticAtac. He works on issues of class and post-communism.